San Diego pest management by Hydrex Pest Control Co. Origin: Thought to be native to Egypt, where it was found in the tomb of King Tut, this beetle now is found throughout the world. 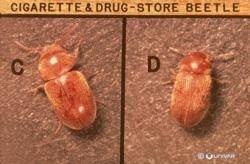 Biology: Closely related to the Drugstore Beetle, the Cigarette Beetle will infest virtually any food product of vegetable origin, including baked goods and spices. It also is a severe pest of stored tobacco or tobacco products. It will bore into books, objects stuffed with straw or flax, dried flower arrangements, and other odd materials. The adult beetles can fly well, but they do not feed. Each female beetle can lay about 30 eggs, and the time from egg to adult is about 2.5 months, with up to 6 generations in one year in warm climates, only 1 generation in colder climates. Adult beetles live about one month. Identification: Like the Drugstore Beetle, the Cigarette Beetle has its head strongly deflexed, or hidden under the prothorax, and when not walking it assumes somewhat of a “C” position. It has a more reddish color and is shiny, due to the very small pores on its exoskeleton. It is a very small beetle, usually around 2 mm long or less. The antennae are very different from its cousin, in that they are serrate, with all the segments the same size and shape, and without an enlarged club at the end.